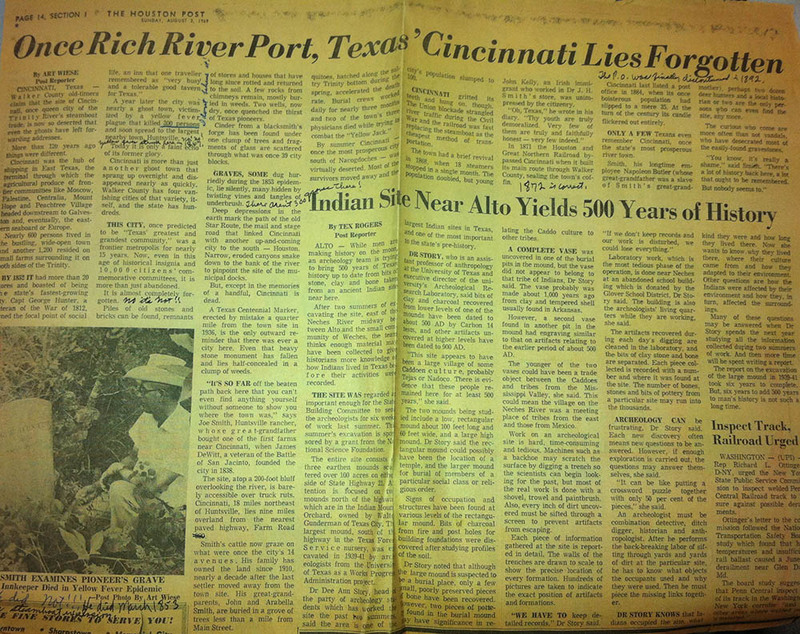 "Once Rich River Port, Texas' Cincinnati Lies Forgotten"
ID: 2011 ~ Source: Courtesy of Jeff Littlejohn. This article by Art Wiese, published in The Houston Post newspaper on August 2, 1969, marveled at the mystery behind why this "queen city of the Trinity River's steamboat trade" seemed to be forgotten in time. In it, Wiese discussed a little of the town's history and spoke with the rancher who owned the property on which Cincinnati stood. He described the town as "once [Texas's] most prosperous river town" and listed some of the remains that had been found, such chimney stones, bricks, and scattered glass. The article also included a photograph of gravestones and notations in pen by someone who evidently had read the article with great interest. If anything, this article indicates that while Cincinnati is still not widely known, it is certainly of great interest and significance to the history of Walker County and Texas.